Helen Gifford was born in Hawthorn in 1935. She was educated at Tintern Junior School and Melbourne Girls Grammar. A Commonwealth scholarship was obtained for the music degree course at Melbourne University Conservatorium, where she studied piano with Roy Shepherd and harmony with Dorian Le Gallienne, gaining her Bachelor of Music in 1958. Phantasma (1963), for string orchestra, was chosen for submission to the ISCM Festival at Copenhagen. On receiving the First Commission of the Dorian Le Gallienne Awards in 1965 she wrote a string quartet that was performed at the 1966 Adelaide Festival. Chimaera (1967), and Imperium (1969), both for large orchestra, were recorded by the ABC on their in-house LPs. 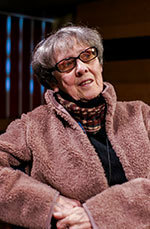 Between 1970 and 1982 Helen Gifford received regular commissions to write music for Melbourne Theatre Company productions. Directors included Rick Billinghurst, Tyrone Guthrie (UK), Frank Hauser (UK), Ray Lawler, Bruce Myles, David Myles, Mick Rodger (UK), John Sumner, and Joachim Tenschert (Berliner Ensemble), for plays by Brecht, Congreve, Shaffer, Shakespeare, Sophocles, Stoppard and Tourneur. In 1973 Helen Gifford was awarded a Senior Composer's Fellowship, and in 1974 was appointed composer in residence to the Australian Opera. Two substantial music theatre works were written on grants from the Music Board of the Australia Council: Regarding Faustus (1983), and Iphigenia in Exile(1985) - in 2010 given the alternative title of Exile for internet use. In 1993 she received a grant from the Edward H. Green Foundation, and in 1997 wrote a work for mezzo soprano and orchestra, Point of Ignition, while on a composer fellowship from the Australia Council. In 1996 she was awarded Doctor of Letters (honoris causa) by Monash University. Music for the Adonia (1993) was her first work written specifically for the vocal talents of soprano Deborah Kayser. It was commissioned by the Elision Ensemble, who provided the accompaniment of piccolo/flute, clarinet, percussion, harp, mandolin, 10-string guitar, viola and cello. The text is an imaginary ancient language, and the piece aims to evoke the music for one of the festivals of Adonis that took place all around the ancient world. In 1999 ABC Classic FM commissioned the piano piece, As Foretold to Khayyam, for Michael Kieran Harvey, for the millennium. The same year she completed a 50-minute work for choir and instruments, Choral Scenes: The Western Front, World War I, commissioned by Astra - a setting of verse from that time in English, French and German. Catharsis (2002) was another choral work written for the Astra choir, which sets verse by Anna Akhmatova, Kathleen Raine and Elizabeth Riddell. Three poems of Kathleen Raine provided the text for a a work in the following year: Spell Against Sorrow (2003), for soprano and guitar, written for Deborah Kayser and Geoffrey Morris. Menin Gate (2005) was another work for piano written for Michael Kieran Harvey. This won APRA/AMC Classical Music State Award for Victoria 2006. A series of short piano pieces that is still ongoing, commenced in 2005 with Presentiment and Obsession, which were the first in a series of focused piano expressions that had as their stimulus various mental states and conditions. Others to follow were Loss and Lost in 2007, Quadary and Nostalgia (2009-2010). Paganini (2006) is an adaptation of one of Paganini's 24 Caprices for violin solo: Caprice No. 20. An interest in solo vocal declamation led to three settings from Shakespeare: Walking Shadows (2006), for Jerzy Kozlowski, Come, You Spirits (2008), for actor Jane Nolan, and The Undiscover'd Country (2008), for baritone Nicholas Tolhurst, while she continued writing for the Astra choir with The Tears of Things (2010). This work includes a spoken part for actor Jane Nolan, which relates the story of Australian nursing sister May Tilton in World War I, and combines with a Latin text of short excerpts from Virgil's Aeneid, sung by the choir. In 2010, David Young, Artistic Director of Chamber Made Opera, arranged for the ABC to record Iphigenia in Exile, now given the alternative title of Exile. With soprano Deborah Kayser, and an ensemble of percussionists, clarinets, piccolo/clay flute, mandolin-guitar and a women's chorus, the recording was made in June in front of a live audience at the Iwaki Auditorium by ABC Classic FM. This recording will now become part of an interactive music video iPad application by Champagne Valentine in Amsterdam, and launched online in December this year. Set on a desolate coastline, Exile explores the psychological state of Iphigenia as she reflects on her time as a high priestess of human sacrifices. This form of the work will combine Greek tragedy, chamber opera, advanced digital media, new mobile technologies and contemporary music. Undertones of war : piano solo (2015) Commissioned by Melbourne Composers' League for performance by Michael Kieran Harvey. Catharsis : three poems for unaccompanied chorus (2001) Commissioned by Astra Chamber Music Society, Astra Choir. Choral scenes : a work for speakers, chorus and instruments (1999) Commissioned by Astra Chamber Music Society. Music for the Adonia : for soprano and 8 musicians (1993) Commissioned by Elision Ensemble.